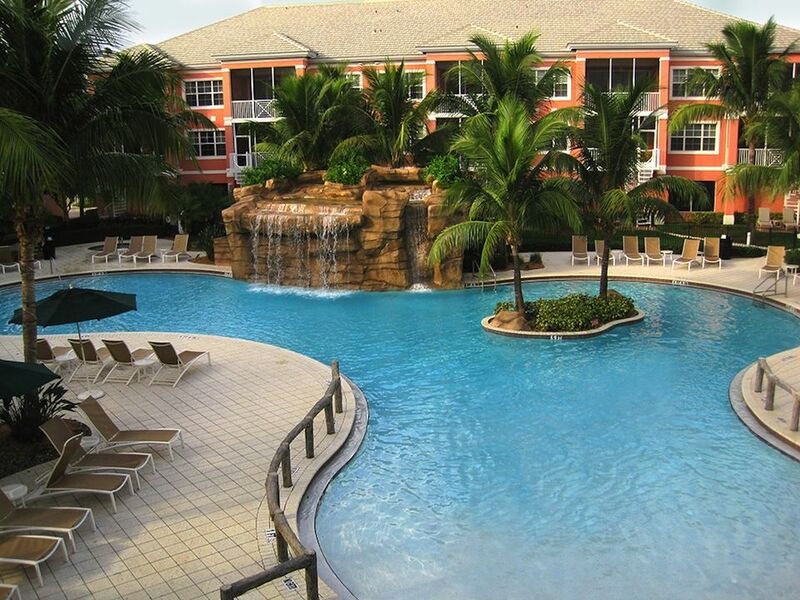 Bit O Paradise - Spectacular condo overlooking resort pool and minutes to the beach! Bit 'O Paradise Warm Gulf Breezes! 2 Pools! 5 Beaches! PUT SOME SIZZLE IN YOUR WINTER VACATION! DON'T BE LEFT OUT! ENJOY A FANTASTIC RESIDENCE AS YOU MAKE MEMORIES TO LAST A LIFETIME! "Bit O' Paradise" is considered one of the best located two bedrooms in Bonita Village! From the lanai you enjoy the active Resort Pool, The Groggy Frog, and the Island House while listening to the gentle sounds of the cascading Waterfall. You will appreciate the morning sun as well as the afternoon shade on your comfortably furnished balcony. The overall vacation atmosphere is complimented by the casual upscale living environment. It is the perfect place to make a lifetime of memories! The best part is...Bonita Village is close to everything! You can have your feet in the warm sands of Bonita Beach in as little as 180 seconds, or be shopping at Coconut Point Mall in 10 minutes. Coconut Point is the second largest open-air mall in the country! Upon arrival the "Beach Entry" Resort Pool and Waterfall will be all yours. Next to this magnificent pool is our Chickee, dubbed The Groggy Frog, which has 2 TV's, casual food and cold beverages in season and most weekends. You will find yourself a frequent visitor as this is a great place to meet the residents and make new friends. Also, for your enjoyment are two large Spas, and The Island House. You have full use of this clubhouse which hosts the marvelous Cybex Gym, Billiards Room, plus Game, Media and Social Rooms. Everyone tells us they enjoy the "Tropical Feel" of this residence as it complements the community's atmosphere. The main living areas and lanai feature porcelain tile floors, granite kitchen counters, and crown molded volume ceilings. Brand new 60" Smart TV with wifi in Living Room. The Master Suite offers a King Bed and Flat SCREEN TV with DVD. The Master Bath with a dual vanity granite top also has a spacious shower and walk-in closet! The Guest bedroom with two twin beds also has a 37" Flat Screen TV. For your computer needs, high-speed wireless Wi-Fi Internet. Owner also provides telephone service for their guests. There is something for everyone at Bonita Village; whether a workout at the Fitness Center, playing Billiards, making friends around the Pools, or even riding the Free Private Beach Shuttle to shell-ladened Bonita Beach! Also available for your sunbathing pleasure is the "Quiet Pool". It is a great place to immerse yourself in that new novel. For a delightful evening out sample one of the 20 plus specialty restaurants close by. If you enjoy the arts, you may prefer an evening at the Philharmonic. To step it up a notch, visit bustling Fifth Avenue in downtown Naples. A host of outdoor sports and activities are only a stone's throw away. Quick and convenient access to Bonita Village is available from the Regional Southwest Airport (RSW) which is only 25 minutes. Call or email us with your questions but be sure to book your vacation soon! Preferred weeks and months went fast last year. By taking action now you will be assured of a reservation and can prepare to "Experience the Fun of Bonita Village"! This amenity rich resort-style condominium will not disappoint you! Our Gazebo is also known as a Chickee Hut in Florida. The Groggy Frog is over-sized, offers cool shade, 2 TV's, casual food and drinks in seasons and most weekends. The Cybex Fitness Center and Private Beach Shuttle are included and no charge. You'll enjoy the Waterfall and center Island in the Resort Pool. Enjoy! Security damage waiver fee $40.00 - State and County Tax 11%.